My Quato/Canon/Epson scanner was not found on my Mac OSX/macOS system. My Quato/Canon/Epson scanner was not found on my Mac OS X / macOS system. Only 32bit drivers are available, but an 64bit OS X/macOS system is being used. 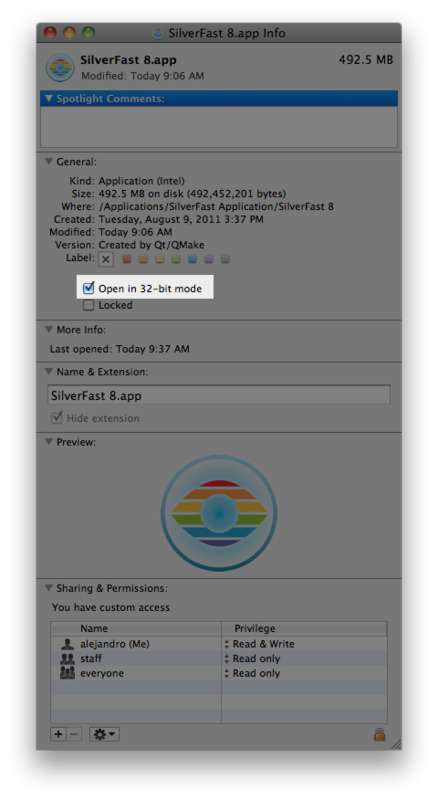 In some cases installing an additional SilverFast version can reset the 32 Bit option to 64 bit. Some OS X/macOS help/cleaning tools might reset the 32 Bit option, because it thinks that SilverFast runs better in 64 Bit mode. First make sure you are logged in as an administrator. 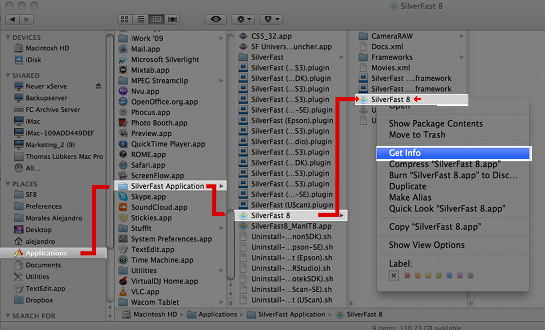 Right-click (Ctrl+click) on the "SilverFast 8" application. Now just check the "Open in 32-bit mode".